The Ganga Plains, one of the key corridors of the SSS programme, constitute one of the world’s most extensive alluvial tracts and are home to hundreds of millions of people, mostly dependent on agriculture. The Ganga plains are of great significance from an academic standpoint, as they hold important clues regarding the tectonic and climatic factors that governed the interaction between the Himalayan orogen and the Foreland. Understanding the landforms of the Ganga Plains, - their origin, development and dynamic imprints is therefore of critical significance to plan effectively for sustainable development of the region and to track changes in the alluvial landscape on different time scales – for example decadal, century, millennial and higher order time scales of 104 – 105 years. Gandak megafan in the eastern Ganga plains. 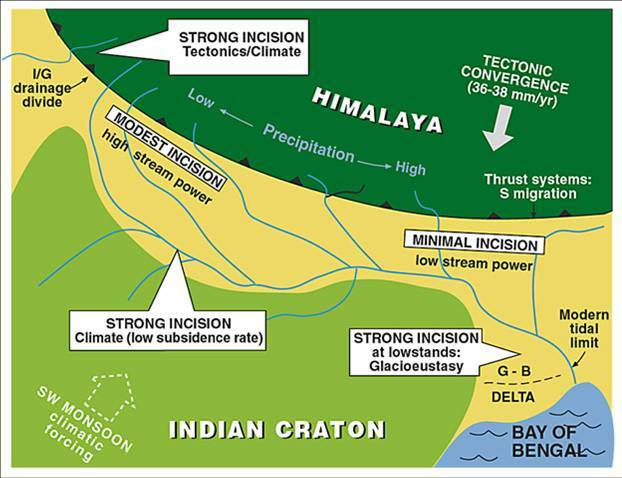 To understand the evolutionary history of the mountain exits of the Ganga river system. To understand the surface processes, sub-surface properties and their dynamics in an extensively used floodplain. To develop a core archive facility at IIT, Kanpur for preservation, maintenance and management of the drill cores.